Yesterday I was reflecting about the meaning of being thankful. My mind went to the usual–and accurate–places; I am thankful to God, for my family, friends, etc. However, the more deeply I thought about it, a vivid memory surfaced–one that I had not recalled for at least two years. 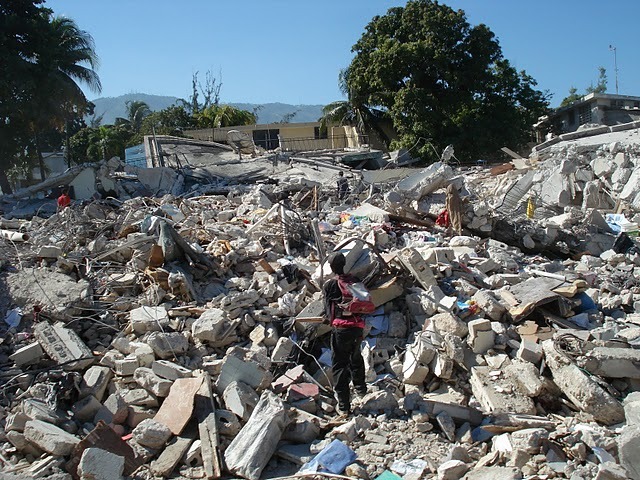 On Tuesday, January 12, 2010, Port Au Prince, Haiti was hit with a magnitude 7 earthquake, devastating the impoverished island nation. That day, over 300,000 people lost their lives, 300,000 more were injured and over 1,000,000 became homeless. Through Divine providence, I found myself in Port Au Prince, Haiti just a few days after the quake. Working with our good friends, Kurt and Debbie Holthus of Hope International Ministries, I was a part of a group of surgeons, surgical nurses, logistics experts and ministers. Our job was to do whatever we could to help. The first few days on the ground were a bit tumultuous. We were sleeping on the grounds of a walled, half-built elementary school in the city. There were guards standing at the locked gate, keeping watch over our truck and over a million dollars worth of medical supplies as well as our personnel. I was laying on a concrete floor in a sleeping bag and couldn’t seem to fall asleep; there were constant after-shocks and chronic Voodoo drums surrounding us. As I lay there trying to sleep, I could faintly hear some singing coming from the street in front of our gate. I nudged my buddy, Pastor Ken Cramer, who was in the next sleeping bag, and asked him if he wanted to join me in checking out the singing in the street. Within a couple of minutes, we were both standing just inside the gate, listening to a group of people sing songs in Haitian Creole on the other side of the wall. Suddenly, I recognized the tune they were singing: Fanny Crosby’s classic, “Blessed Assurance!” By this time, Kurt Hothus had joined us and we convinced the guard to let us out of the gate to see who was singing. The three of us quickly sat down on the curb, against the compound gates and as our eyes adjusted to the darkness, we couldn’t believe what we were seeing. There were dirty mattresses neatly fit together in the center of the street, and upon them, were probably 30 or more people singing as their children were falling asleep on their laps. Their houses had been destroyed and they were afraid that further aftershocks would cause nearby buildings to topple down on them, so the middle of the street was the safest place to be. As our eyes became familiar with the darkness, we could see the people’s condition. There was a woman with a broken leg; her foot was twisted around and lying on the mattress in an unnatural position. There were sleeping children with bandaged heads. Most of the people lying on the mattress pallet were injured in some way. The three of us found ourselves almost unconsciously singing along to the familiar tune of “Blessed Assurance,” though we were singing in English. I looked over at Kurt and Ken and they, like me, had tears streaming down their cheeks as the language/culture barrier was collapsing. Overcome with emotion, my heart felt like it was going to explode with a peculiar mixture of sorrow, pain, empathy, joy and belonging. As the song came to an end, the lady with the twisted, broken leg began to lead the next song. It was obvious that the song was particularly meaningful, because the whole group began to raise their hands and cry as they sang this song with more passion than we had yet heard. I looked at my companions and asked them if they knew what song this was, but they, like me, recognized the familiar tune but couldn’t figure out the English lyrics. To say that I was overcome would be an understatement. I don’t remember ever crying that deeply; it felt like the sobs came from my very soul. Ken, Kurt and I quickly went and got these folks food and help. Though we would move the next day–and not see them again, I relived this vivid, life changing memory again yesterday and yet another time in writing this. Gratitude is not based on how much we have, our present condition or our sense of security. We give thanks because of what the Lord Has done for us. Have a blessed, authentic Thanksgiving. This entry was posted in Blog, Ministry, Revival, Spiritual Leadership. Bookmark the permalink. Thank you for your reminder to those of us who have been blessed enough to have more than enough. Reading your words brought back such emotion that I didn’t realize was still in the depth of my soul as I was a part of that trip with you. Thanks for your words and reminder of the what the Lord has done and is doing. Tears still flow from somewhere deep inside as the Holy Spirit gently reminds me to pray and keep praying. Awesome post Tim! There’s still power in the pain! Trust in the tumult. Grace in their hearts in His amazing love!